I went for a walk yesterday around a neighborhood near where I used to work, but I hadn't been to before. I can't remember what used to be there, but derelict is the word that comes to mind. Now it's full of new, not quite finished glass office buildings and apartments and open spaces near the end of the Grand Canal. It's the type of place that was designed to be teeming with people on warm summer evenings. I get this feeling a lot lately. 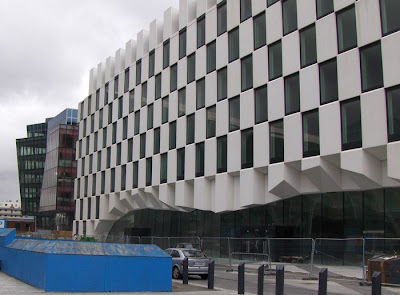 Everywhere I look I see office buildings nearing completion, but when as of last July we already had a office vacancy rate of 20% in Dublin, I can't help wondering how many years will these new offices be empty? Or how many other buildings will have to be emptied in order to fill these? It can get you down, walking around. 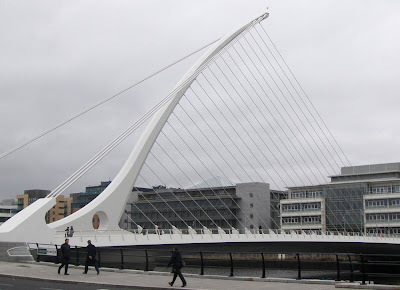 That's why I was probably more heartened than I should have been when I came to the River Liffey and found I was right near Dublin's newest bridge, the Samuel Beckett Bridge. 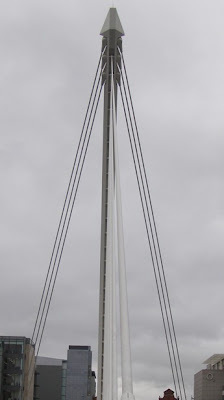 The Beckett Bridge officially opened last month and it's beautiful, even on a miserable, gray, cold, windy day like yesterday. The architect of the bridge, Spaniard Santiago Calatrava, says his design was inspired by the harp on the back of Irish coins, which I can kind of see when I look at it from the side. However, when I was right in front of it, looking straight up at it, it looked a lot more like an arrow pulled tight against the bowstring, poised to fly into the sky. Two or three years ago such an image might have struck me as another sign of the hubris that had infected this city and the country as a whole, but now with the hubris well and truly knocked out of us and the country practically in the fetal position fearing another blow, Dublin unveils a piece of functional infrastructure that is inspiring to behold and pointing us in the direction we must go. I really liked it. The bridge makes such a confident statement at a time when talk of confidence can seem unreal. Maybe it was the cold and wind affected my thinking, but I was kind of lifted when I saw the bridge, although I was brought down a notch when I had to make my way back through the alleys surrounded by empty offices.